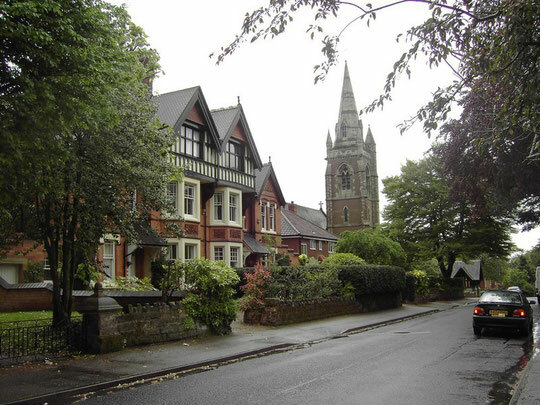 The rural suburb of Moseley was developed with housing from the 1860s. Although the old parish church of St Mary's was progressively enlarged from this time, it was nonetheless felt there was a need for a new church less than half a mile away to cater for the needs of the residents of the new very large villas built around the edge of Moseley Hall park. The church website which also includes St Mary's Moseley - http://www.moseleybenefice.org.uk/. See - http://www.moseleybenefice.org.uk/index.php/discipleship/41-history/78-a-brief-history-of-st-annes.html - for a brief history. You might also be interested in A History of Birmingham Places & Placenames . . . from A to Y - Moseley - http://billdargue.jimdo.com/placenames-gazetteer-a-to-y/places-m/moseley/. From the middle of the 19th century Moseley began to develop as a well-to-do suburb well away from the industrial town of Birmingham. Some very substantial houses were built around the parkland of Moseley Hall and it was here, on the north edge of the park that St Anne's was built in 1874. The site for the new church, a daughter church of St Mary's, was given by W F Taylor of Moseley Hall and the building of the church financed by wealthy local landowner, Rebecca Anderton. A parish was formed the following year out of that of St Mary's parish. The church was designed by the prolific architect, Frederick Preedy, and is built mainly of cream and red rock-faced sandstone in a revived Gothic style. The church consists of a small chancel, a 4-bay nave with clerestorey and side aisles and a 3-stage north-west tower tower with a spire. The main entrance is at the foot of the tower. A choir vestry was added to the south-east of the chancel in 1898, and a polygonal baptistery added at the west end in 1923. That same year a church hall was built south of the church. St Anne's was badly damaged by German incendiary bombs in 1940 and was rendered unusable; services were held in the church hall. The church was restored and reconsecrated in 1948. All the window glass was destroyed by the bombs and three new stained glass windows were installed in 1950, 1956 and 1967. The Brindly and Foster organ of in 1908 was refurbished in 1948 and has been augmented and restored more recently. Shortly after the church was completed, three old bells from St Mary’s and one new bell were hung in the tower by Barwell's of Birmingham in a 5-bell frame. These were rung by means of an Ellacombe apparatus. The old bells were dated 1638, 1650 and 1740. In 1882 Barwell's submitted a quote for recasting the old bells, replacing the old fittings and providing a new tenor bell at a cost of £107. However, this work was never carried out. In 2000 a redundant bell of 1665 from Bagworth, Leicestershire was added and the ring retuned and rehung for swing chiming. In 2000 the peal was converted to a a full circle ring of 6, the tenor being replaced by a new bell and the previous one kept as a service bell. A bell cast by Warner's of London in 1904 has been installed as the treble. The bells were rededicated by the Bishop of Aston on Sunday 3 December 2000. From the church website a brief history - http://www.moseleybenefice.org.uk/index.php/discipleship/41-history/78-a-brief-history-of-st-annes.html and some information about the damage to the church caused by a German incendiary bomb in December 1940 - http://www.moseleybenefice.org.uk/index.php/evangelism/62-chimes/226-memories.html. and St Martin's Guild of Church Bell Ringers - http://smgcbr.heralded.org.uk/index.php?q=node/113. Historic England website - https://historicengland.org.uk/listing/the-list/list-entry/1076222.